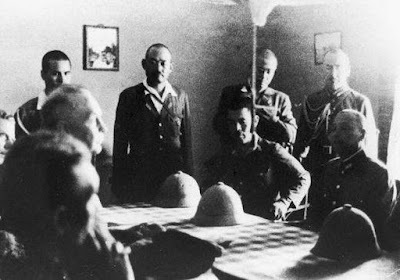 The surrender of the Netherlands East-Indies to the Japanese at Kalidjati military airport, Subang, West Java, on 8 march 1942 The Governor General of the Netherlands East-Indies had ordered to avoid armed conflict in the city of Bandung, crowded as it was with refugees. With the invading Japanese forces already in Lembang and Buitenzorg, a few miles away, the commanding officers had no choice but to surrender. The negotiations took place on March 8, 1942 at Kalidjati airfield. Thoughtful as always the Japanese had lined the road to Kalidjati with hundreds of corpses of those killed in the defence of this airfield! Lieutenant General Hein Ter Poorten surrendered unconditionally to General Hitoshi Imamura and after a few more days all fighting in Java ceased. But in other places the fight went on longer. Sumatra KNIL forces capitulated on March 29 and the Australians and Dutch on Timor continued a guerrilla war for several months. Infanterie-Regiment 577 of 305. Infanterie-Division, supported by Sturmgeschütz III Ausf.E assault gun of Sturmgeschütz-Abteilung 245, push into the Barrikady gun factory from the north of Stalingrad on 16 October 1942. The collapsed building is the warehouse on the northwest side of the factory. Assault guns supported the infantrymen as they pushed into the chaotic tangle of railway sidings, gutted warehouses and stacks of gun barrels that lined the western edge of the Barrikady Gun Factory, the assault guns in turn being guided on to their targets by the soldiers. The large-scale German attack on that day sweeping south through the brickworks and into the factory. Despite the menacing bulk of the factory’s workshops, progress was quite good. The panzers of 14. Panzer-Division suffered an initial setback when they lost 17 of their number to dug-in T-34s. Nevertheless, by the end of the day, the overall balance favoured the attackers: a large section of the gun factory was in German hands, as was a lengthy stretch of the Volga cliffs east of the brickworks and tractor factory. These operational successes were not as apparent to the weary infantrymen as was the loss of so many long-time comrades. 305. Infanterie-Division lost 1 officer and 30 men killed, 5 officers and 74 men wounded, and 1 officer and 13 men missing; 14. Panzer-Division lost 2 officers and 21 men killed, 4 officers and 121 men wounded, and 2 men missing. The photographer was Kriegsberichter Kurt Heine, and most of his photos were taken in November 1942 around the Barrikady Factory ruins. 16 May 1940. German troops, after the capitulation of the Dutch Armed Forces, on the Reguliersbreestraat and Rembrandtplein in the center of Amsterdam, on their way to Utrecht. In the background we can see the Munttoren ("Mint Tower") or Munt. It stands on the busy Muntplein square, where the Amstel river and the Singel canal meet, near the flower market and the eastern end of the Kalverstraat shopping street. On the left is cafeteria Heck’s Popularis. Despite being neutral, the Netherlands in World War II was invaded by Nazi Germany on 10 May 1940, under orders of Adolf Hitler. 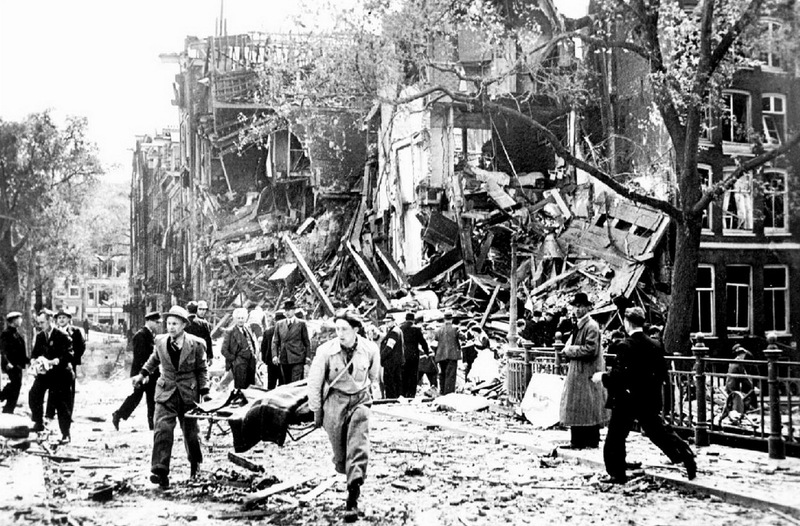 On 15 May 1940, one day after the bombing of Rotterdam, the Dutch forces surrendered. The Dutch government and the royal family saved themselves by going to London. Princess Juliana and her children moved on to Canada for additional safety. The Netherlands was placed under German occupation, which endured in some areas until the German surrender in May 1945. Active resistance was carried out by a minority, which grew in the course of the occupation. The occupiers deported the majority of the country's Jews to Nazi concentration camps. 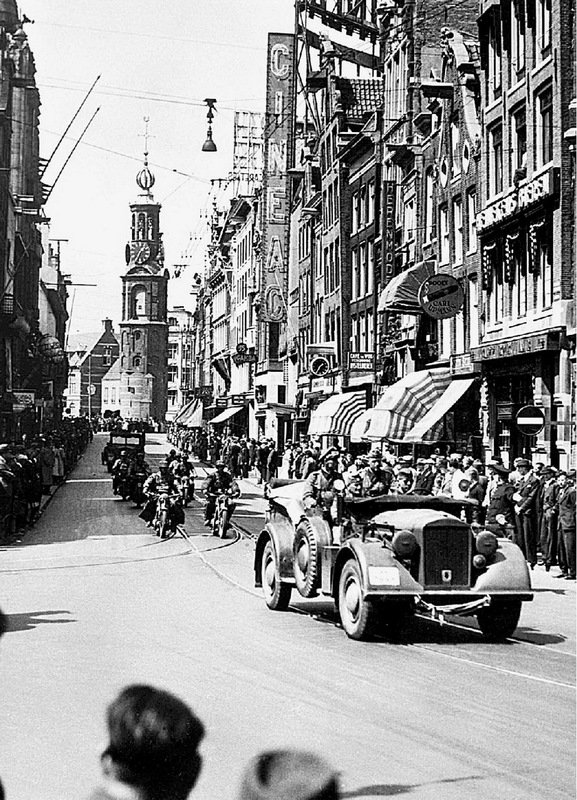 Dutch SS ceremony in Utrecht, 11 May 1941. On 11 September 1940 the NSB (Nationaal-Socialistische Beweging in Nederland) formed the Nederlandsche SS (Dutch SS), it had up to 7,000 members. Himmler's vision for a Germanic SS started with grouping the Netherlands, Belgium and north-east France together into a western-Germanic state called Burgundia which would be policed by the SS as a security buffer for Germany. 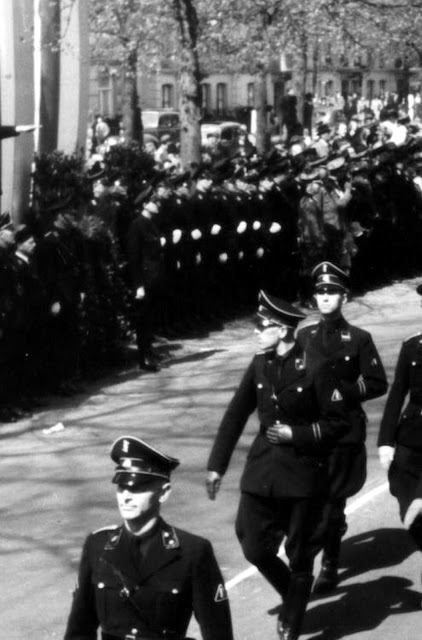 In 1940, the first manifestation of the Germanic SS appeared in Flanders as the Allgemeene SS Vlaanderen to be joined two-months later by the Dutch Nederlandsche SS and in May 1941 the Norwegian Norges SS was formed. The final nation to contribute to the Germanic SS was Denmark, whose Germansk Korpet (later called the Schalburg Corps) came into being in April 1943. For the SS, they did not think of their compatriots in terms of national borders but in terms of Germanic racial makeup, known conceptually to them as Deutschtum, a greater idea which transcended traditional political boundaries. While the SS leadership foresaw an imperialistic and semi-autonomous relationship for the Nordic/Germanic countries like Denmark, the Netherlands and Norway as co-bearers of a greater Germanic empire, Hitler refused to grant them the same degree of independence despite ongoing pressure from ranking members of the SS. One of the most iconic photographs of World War II, and of General Eisenhower, this image is forever linked with June 6th D-Day Landing. The photograph was actually taken the evening before the June 6th operations for the allied assault on Normandy, also known as "D-Day." In an English airfield in Greenham Common, members of the 101st Airborne were being briefed for their operation to jump from their gliders in the early hours of June 6th behind Utah beach. General Eisenhower left his command post and drove down to Greenham to spend time with the men of the 101st and 82nd before their jump. Eisenhower had been advised by his tactical air commander that 50 percent of the paratroopers would be dead before they hit the ground, and that 70 percent of the gliders would be lost in the initial air assault. British Air Marshall Trafford-Leigh Mallory warned Eisenhower to cancel the drop on Utah Beach, that in his opinion it would result in the “futile slaughter” of two airborne divisions. Though Eisenhower agonized over the projected heavy casualties, he decided to go ahead with the air drop that would spearhead the invasion. 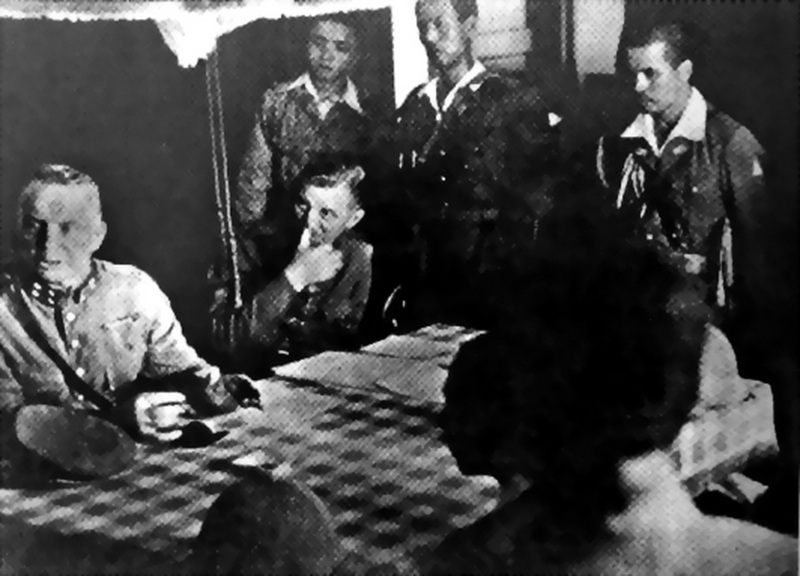 In the snapshot, the general has an intense look on his face and appears as if he could be giving a rousing speech, speaking to a young paratrooper with 23 around neck. That young man was LT. Wallace "Wally" Strobel. But actually, they were talking about fishing. 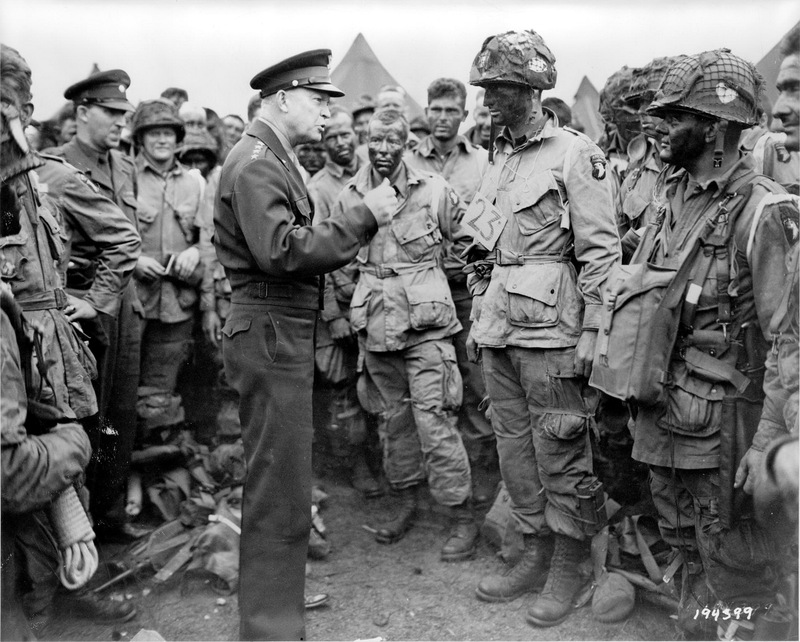 Eisenhower asked where Strobel was from and he replied "Michigan, Sir." "How is the fishing in Michigan?" Eisenhower asked. Strobel replied, "It's great, sir." Eisenhower then said he had visited the state several times himself and that it was a beautiful state. Before moving on, Eisenhower ended with "Go, Michigan." According to Strobel's wife, when the planes took off early the next morning, Eisenhower was standing on the tarmac watching. Wally Strobel survived D-Day, the invasion of Europe and the rest of the war. He returned to Michigan and eventually died of respiratory failure at the age of 77. Servicemen from every unit in the U.S. military have claimed to be in this photo - one of the most famous of World War Il. The paratroopers in this series taken at Greenham Common on June 5, 1944, are all members of the 'E' and 'D' Company of the 502nd Parachute Infantry Regiment / 101st Airborne Division. Anyone saying they are in it who was not a member of that organization is making a fraudulent claim. Left to right: Hans Sannes D/502, Bill Bowser E/502, General Eisenhower, Ralph Pombano E/502, Schuyler Jackson HQ/502, Bill Hayes E/502, Carl Vickers D/502, Lieutenant Wallace Strobel (“23” sign around neck) E/502, Henry Fuller E/502, Bill Boyle E/502, and William Noll E/502. U.S. Army. 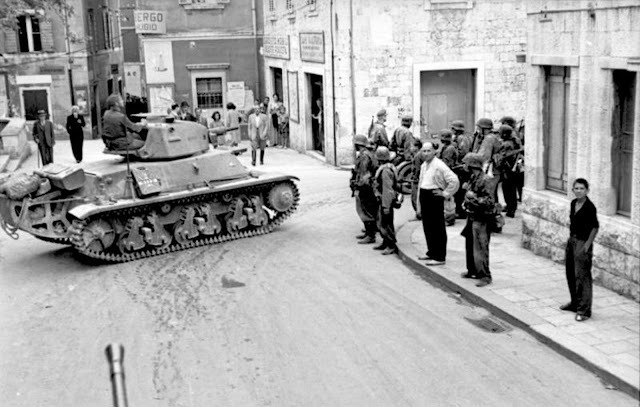 Armoured units of the SS-Freiwilligen-Gebirgs-Division "Prinz Eugen" and the Grenadier-Regiment 92 passing through the streets of the newly-captured city of Split, Croatia, during Operation Achse. In the foreground: A French-built Hotchkiss H38 tank (captured by the Germans after 1940) of the "Prinz Eugen" Division's armoured company, photographed from a vehicle of the 92nd Grenadier Regiment. Operation Achse (German: Fall Achse, "Case Axis"), originally called Operation Alaric (German: Unternehmen Alarich), was the codename for the German plan to forcibly disarm the Italian armed forces after the armistice with the Allies in 1943. Several German divisions had entered Italy after the fall of Benito Mussolini in July 1943, while Italy was officially still an ally of Germany, despite the protests of the new Italian government under Pietro Badoglio. The Armistice of Cassibile was made public on 8 September. German forces moved rapidly to take over the Italian zones of occupation in the Balkans and southern France, and to disarm Italian forces in Italy. In some cases, the Italian troops, that had no superior orders and suffered many desertions, resisted the Germans, most notably in the Greek island of Cephalonia, where over 5,100 men of the 33rd Acqui Division were massacred after running out of ammunition and surrendering; in Rome, after the royal family and the government had fled, a disorganized defense by the Italian troops stationed around the capital was unable to defeat the German attack. Additionally, individual soldiers or whole units, like the 24th Pinerolo Division in Thessaly, went over to the local resistance movements. 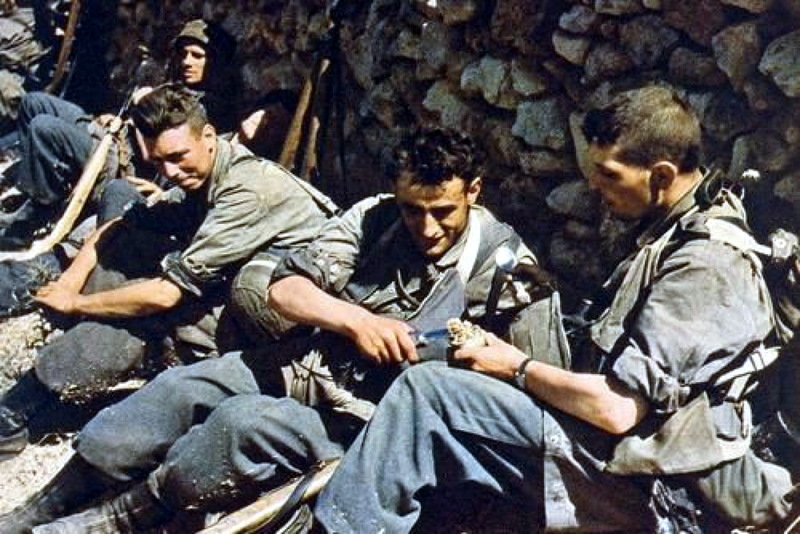 Only in Sardinia, Corsica, Calabria and in the southern part of Apulia were Italian troops able to offer successful resistance and hold off the Germans until relieved by the arrival of the Allies. Leipzig, 18 April 1945, Private First Class Raymond J. 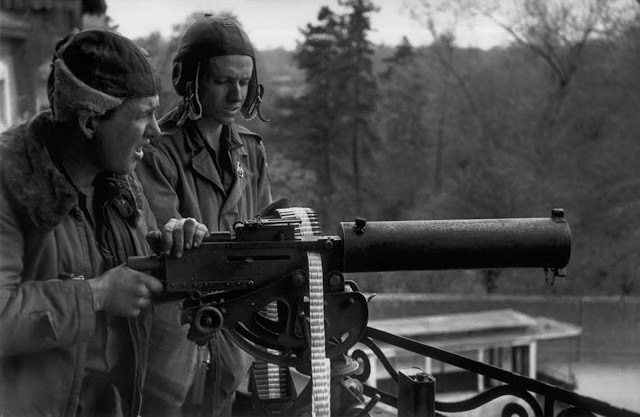 Bowman (right) of “D” Company, 23rd Infantry Regiment and his fellow comrade, Lehmann Riggs, set up their .30 Browning machine gun on an open balcony in order to provide cover for the American troops of the 2nd US Infantry Division, who were advancing over a bridge. This balcony had an unobstructed view on the bridge however this same clear view would turn out to be a deadly mistake for Pfc. Raymond J. Bowman. After taking half of the city, the commanding officer ordered the heavy weapons squad to climb to the third floor of the Jahnallee apartment building (nr. 61). 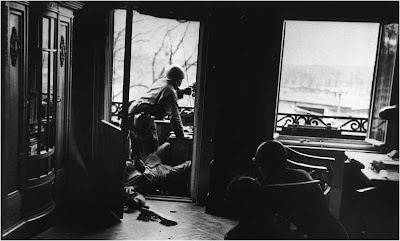 Together with them was famed war photographer Robert Capa. 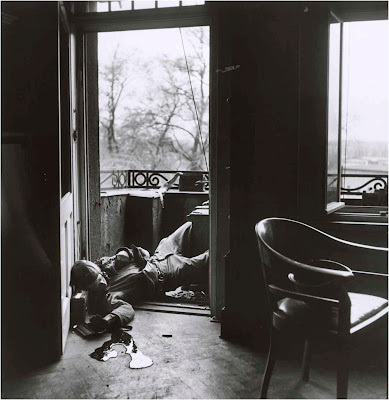 Capa, who was standing just a few feet away from Raymond Bowman when all of this occurred, would later have these photographs published in the May 14, 1945 issue of Life magazine, under the headline “Americans Still Died.” However the identity of the men in the picture was a mystery. It was only after Lehmann Riggs himself shared his memories of that day and the family of Raymond J. Bowman, who identified him by the pin bearing his initials on his collar, that the mystery was solved and later revealed. “We had to go across these bridges to get to the other side of the city. They had blocked the bridges with burned-out tanks and streetcars, anything that would obstruct us from going across. There was a park in front of this building, and they were dug in and we couldn’t see them. 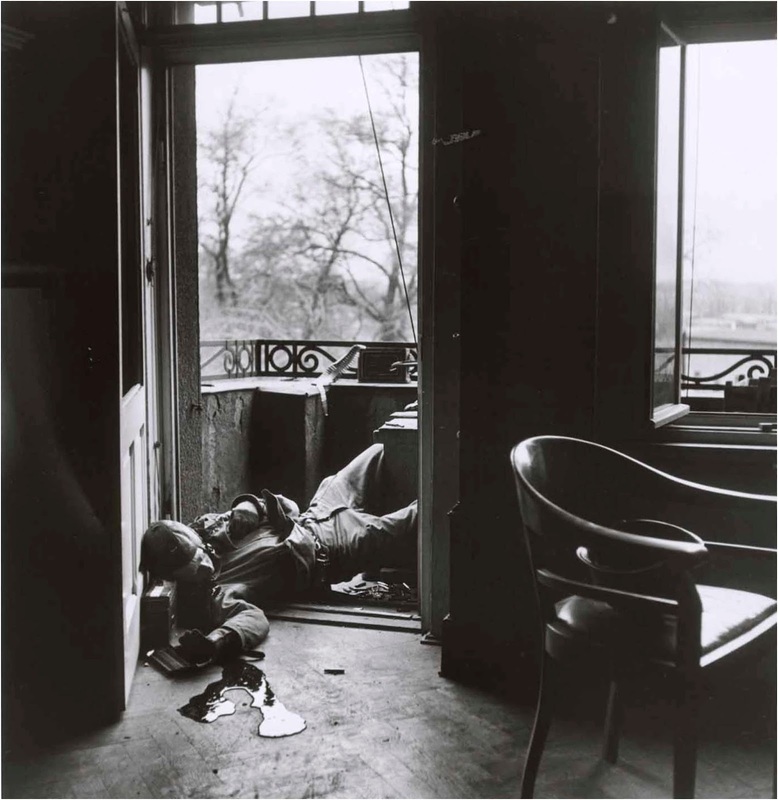 We had orders to go up to the third floor of this apartment building and set up our guns to spray that area out there in the park to try to keep them pinned down until our troops could cross that bridge.“, said Lehmann Riggs. Adding “We only fired with one person at a time, and we alternated…one person being exposed all the time. I had just been firing the gun, and I just stepped back off the gun and he had taken over. In 30 seconds, I happened to look up and see the bullet pierce his nose. The bullet that hit him killed him, ricocheted around the room, and it’s a miracle that it didn’t hit me. As soon as he got hit, somebody had to take the gun. I had to jump over him and start firing the gun.” Raymond J. Bowman was born in Rochester, New York on April 2, 1924, the fifth of seven children. After graduating high school, Bowman was drafted into the United States Army on June 21, 1943. While serving in Company D of the 23rd Infantry Regiment of the 2nd Infantry Division. In January 1944, he was sent overseas to the United Kingdom in preparation for Operation Overlord. Raymond J. Bowman served in France, where he was wounded in action on August 3, 1944. He went on to fight during the Battle of the Bulge and the final battles in Germany. He was decorated with a Bronze Star Medal, an Army Good Conduct Medal and two Purple Hearts. 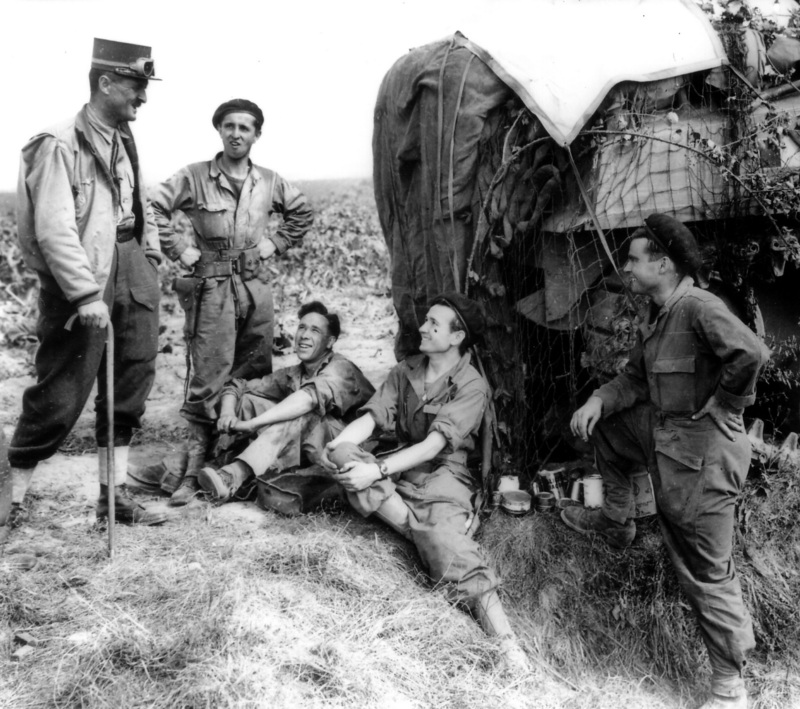 Robert Capa recalled in an interview in 1947: “So it made no sense whatsoever but he (Bowman) looked so clean cut, like it was the first day of the war and he was very earnest. 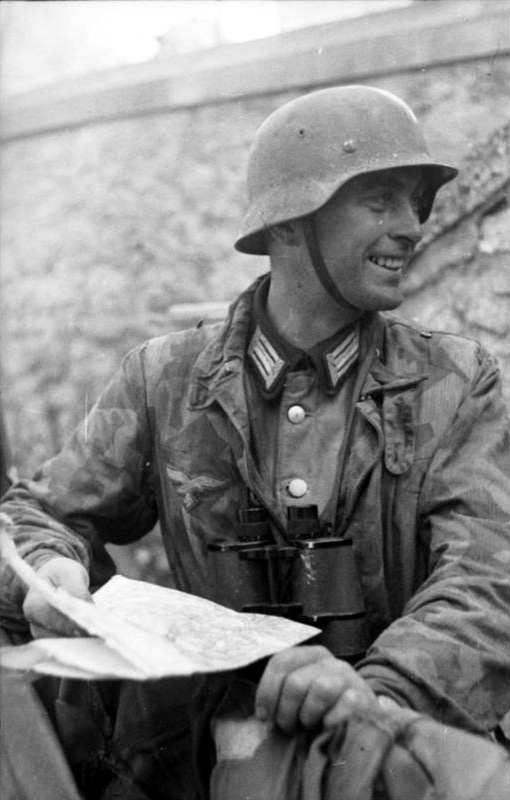 So I said ‘All right, this will be my last picture of the war.’ And I put my camera up and took a portrait shot of him, and while I shot my portrait of him he was killed by a sniper. It was a very clean and somehow a very beautiful death.“ In 2015, the city of Leipzig voted to name the street in which the apartment building is located to “Bowmanstraße”, in honor of Raymond J. Bowman. The renaming took place on April 17, 2016. The apartment building (called Capa House) now contains a small memorial with Capa’s photographs and information about Bowman. Minutes prior to his death, Raymond J. Bowman (seen left now) with his fellow comrade Lehmann Riggs (on the right). 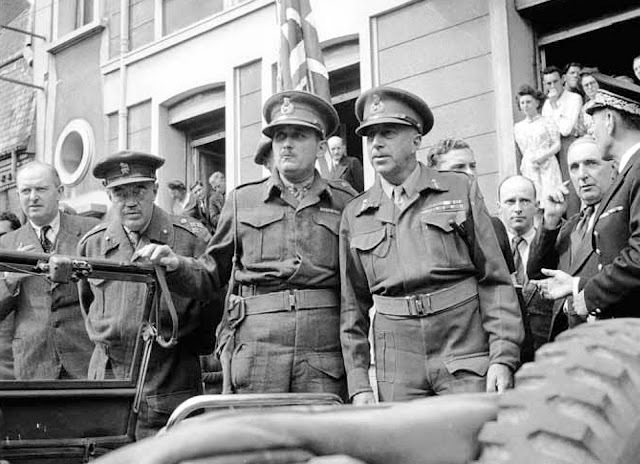 Charles Foulkes (hand on windshield) stands with his patron and protector, Harry Crerar, outside the Mairie in Dieppe, 3 September 1944. When the war broke out, Foulkes was a major with the 3rd Brigade of the 1st Canadian Infantry Division. 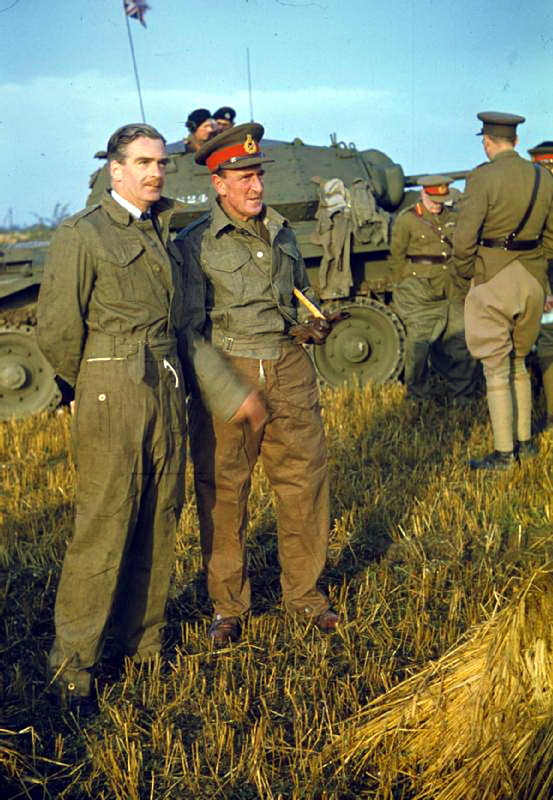 In September 1940, he was appointed General Staff Officer Grade 1 with the 3rd Canadian Infantry Division and General Crerar noted his outstanding ability and broad tactical knowledge. 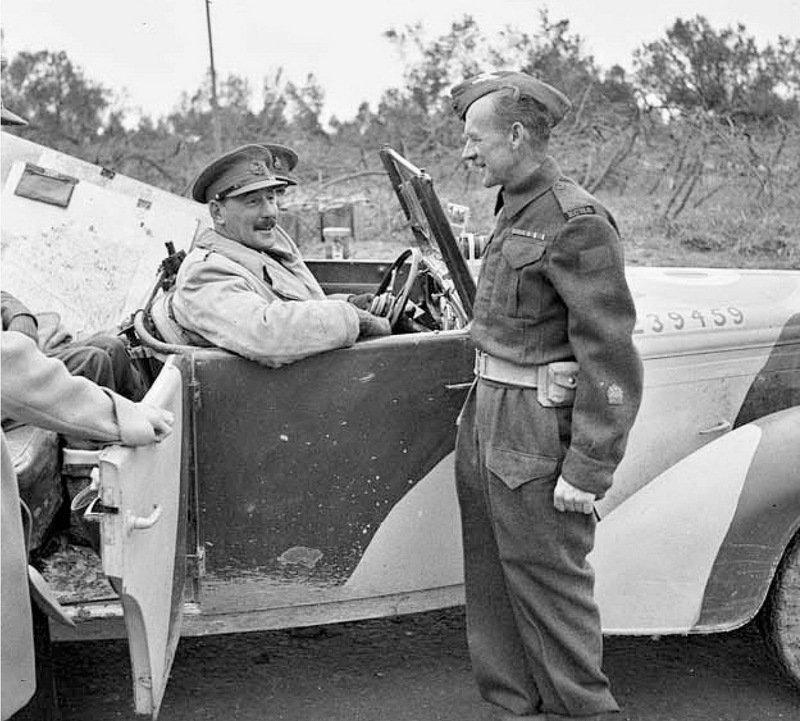 Lieutenant General Harry Crerar had once described Foulkes as possessing “exceptional ability; sound tactical knowledge; a great capacity for quick, sound decision; energy and driving power.” But on the eve of his first battle, he seemed hesitant and uncertain. At forty-one, Foulkes was a contemporary of Guy Simonds. Both Royal Military College graduates and Permanent Force officers, they started the war as majors and enjoyed subsequent rapid promotion. Similarities ended there. 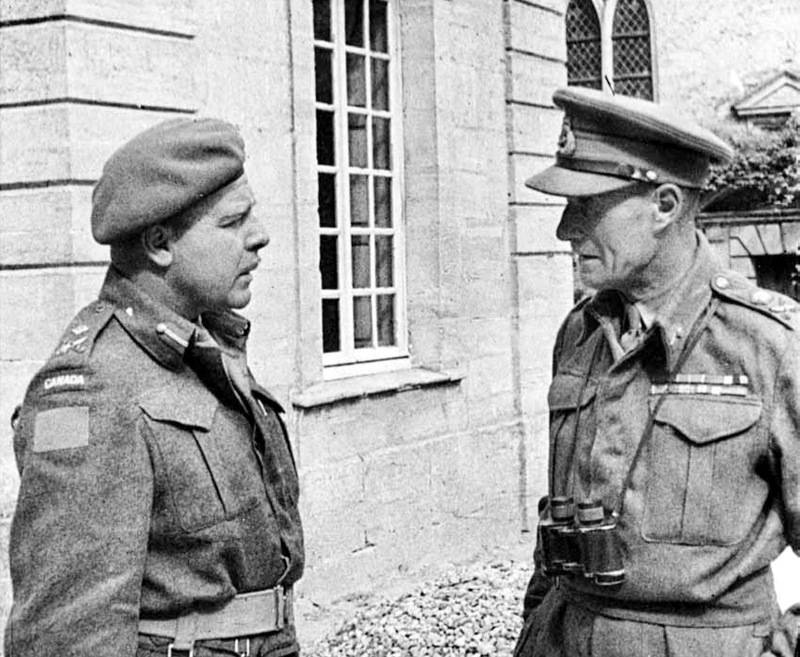 Foulkes was a Crerar favourite, who advanced through staff positions to brigadier. Eighth Army Commander, Lieutenant-General Sir Oliver Leese speaking with Regimental Sergeant Major G.D. Gilpin, 1st Field Regiment, Royal Canadian Horse Artillery, Italy, 8 September 1944. The vehicle is a Humber Super Snipe staff car, "The Old Faithful" of Monty (Census No. M239459). The running boards are already deleted. Leese commanded the Eighth Army at the fourth and final battle of Monte Cassino in May 1944 (when the bulk of the Eighth Army was switched in secret from the Adriatic coast to Cassino to strike a joint blow with the U.S. Fifth Army under Lieutenant General Mark W. Clark, who Leese disliked working alongside) and for Operation Olive on the Gothic Line later in 1944. His rank of lieutenant general was made permanent in July 1944. The 1st Field Regiment itself landed in Sicily in July 1943 and in Italy in September 1943, providing field artillery support for the 1st Canadian Infantry Division. In March 1945 the regiment moved with the 1st Canadian Corps to North West Europe where it served until the end of the war.24 The overseas regiment was disbanded on 25 August 1945. 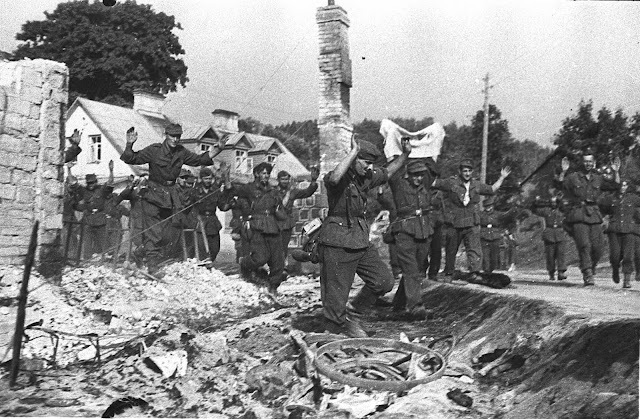 German soldiers surrender to the Red Army in Vilnius, the capital of Lithuania, 11 July 1944. The picture was taken by Fyodor Kislov. 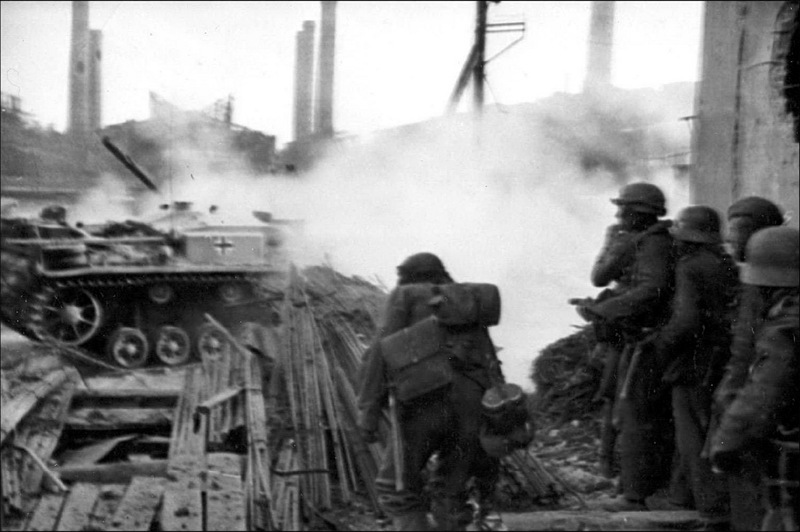 During the battle for the city, the Soviet 5th Army and 5th Guards Tank Army engaged the German garrison of Fester Platz Vilnius (consisting of Grenadier-Regiment 399 and Artillerie-Regiment 240 of the 170. Infanterie-Division, Grenadier-Regiment 1067, a battalion from the Fallschirmjäger-Regiment 16, the anti-tank battalion of the 256. Infanterie-Division, and other units under the command of Luftwaffe Generalmajor Rainer Stahel. The Soviet 35th Guards Tank Brigade initially took the airport, defended by the battalion of paratroopers; intense street-by-street fighting then commenced as the Soviets attempted to reduce the defence. While the German aim of holding Vilnius as a Fester Platz or fortress was not achieved, the tenacious defence made a contribution in stopping the Red Army's drive west for a few precious days: most importantly, it tied down the 5th Guards Tank Army, which had been instrumental in the initial successes of the Red Army during Operation Bagration. This delay gave German forces a chance to re-establish something resembling a continuous defence line further to the west. Hitler recognised this achievement by awarding Stahel the 76th set of the Oak Leaves to the Knight's Cross of the Iron Cross awarded during the war. Nevertheless, the outcome fell far short of what the German command had hoped for, and the continuous frontline that was established only held for a short time. Without the traffic network based on Vilnius, the German position in the southern Baltics was untenable. By the end of July, the 3rd Belorussian Front was ordered to conduct the Kaunas Offensive Operation to further extend the gains of Operation Bagration. 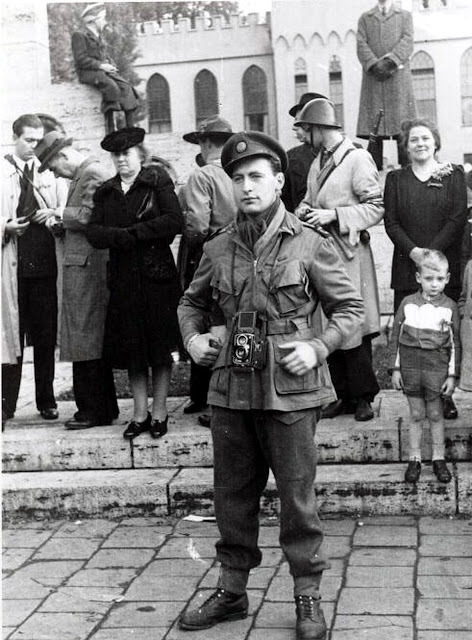 This picture shows a photographer accompanying the British 15th (Scottish) Infantry Division at Tilburg, Netherlands, 29 October 1944. 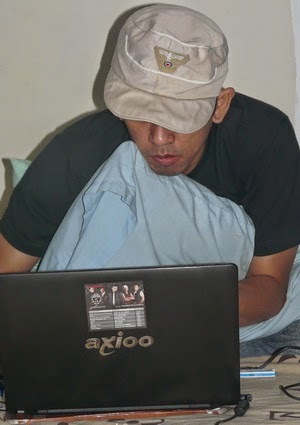 He wore the British Cap (Service Cap) with the British badge for war correspondents. For his pants, he wore a Battledress 37/40 Pattern 37/40 with the British Army leggings and boots. He also wore a USA M1942 parachute jacket in ocher color, shoulder pads with sleeves that bear the insignia with the letters "British War Correspondent". The camera is a German photographic Rolleiflex Automat Type 1B or Type 2 with lens hood attached to the lens. The 15th (Scottish) Infantry Division was an infantry division of the British Army that served with distinction in both World War I and World War II. In World War I the 15th (Scottish) Division was formed from men volunteering for Kitchener's Army and served from 1915 to 1918 on the Western Front. The division was later disbanded, after the war, in 1919. In World War II it was reformed as the 15th (Scottish) Infantry Division on 2 September 1939, the day before war was declared, as part of the Territorial Army (TA) and served in the United Kingdom and later North-West Europe from June 1944 to May 1945. Paras of SS-Hauptsturmführer Kurt Rybka's SS-Fallschirmjäger-Bataillon 500 posing with trophies flags captured during its daring but unsuccessful parachute assault on Marshal Josip Broz Tito's communist partisan headquarters in Drvar, Yugoslavia, on 25 May 1944. Tito and the communist partisans were financed and assisted primarily by the British and the USA. 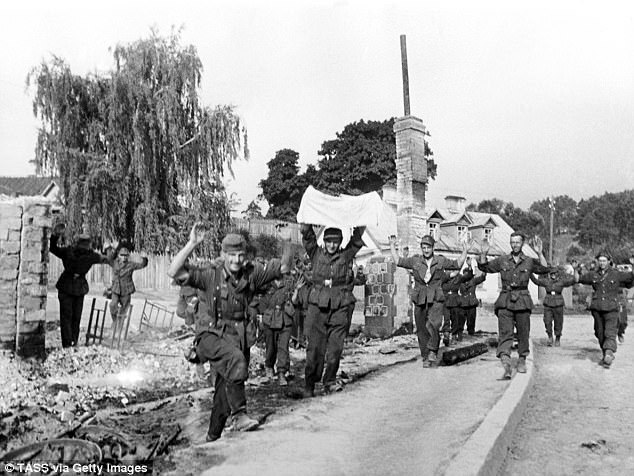 Over 700 of the 1,000 personnel who participated in this operation, known as Rösselsprung, were killed or wounded. The SS-Fallschirmjägerbataillon 500 was a parachute unit of the Waffen-SS made up of an equal percentage of volunteers from both regular Waffen-SS troops, and more specifically, from officially disgraced Waffen-SS officers and enlisted men who wished to redeem themselves under fire. 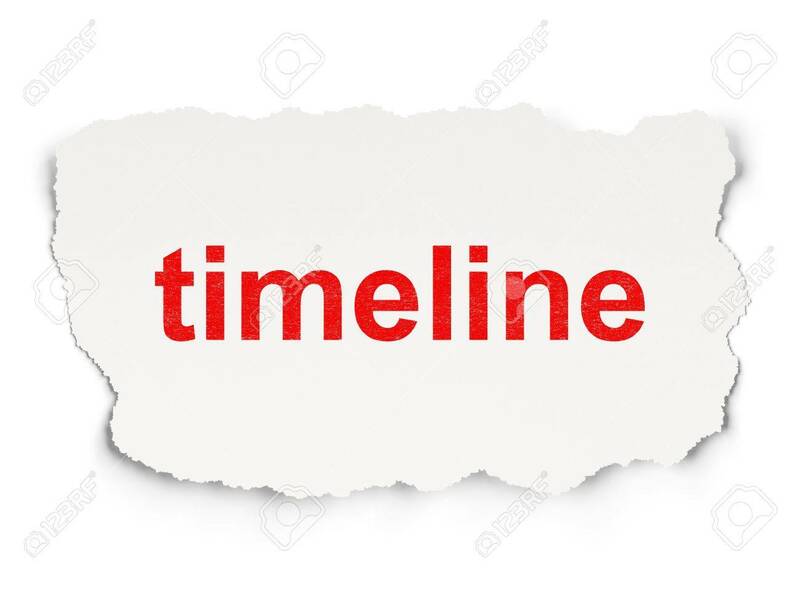 In other words, it was a unit where dishonored officers and men convicted by courts-martial of minor infractions and currently in disciplinary straits could redeem their soldierly honor by participation in hazardous duties and operations. The first gathering of recruits was at Chlum in Czechoslovakia in October 1943. 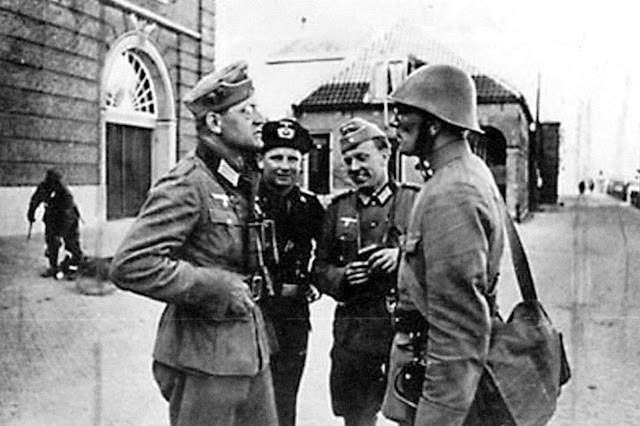 The SS paras wore standard Waffen-SS tunics and caps with Luftwaffe-issue jump smocks, trousers, boots and M38 helmets. Most of the volunteers appear to have removed the Luftwaffe breast eagles from their smocks. The training was completed at the beginning of 1944. The battalion often acted as a 'fire brigade' in the defense of the Baltic States. The brave paratroopers of the SS-Fallschirmjägerbataillon 500 who survived long enough to see the formation of the SS-Fallschirmjägerbataillon 600 were given back their previous ranks and the right to wear the SS sig rune on 9 November 1944. At least five Scandinavians are known to have served in this battalion. 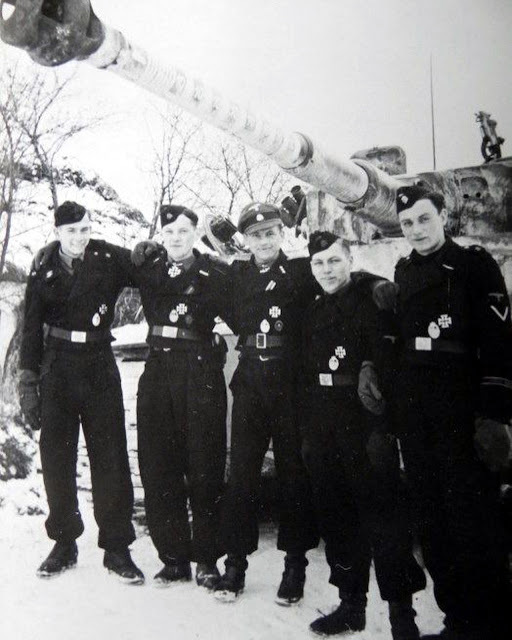 Two companies of the later battalion took part in the Ardennes offensive in December 1944 as a part of the Austrian SS-Obersturmbannführer Otto Skorzeny's 150.SS-Panzer-Brigade wearing American uniforms and using American equipment. Only 180 out of 3,500 Waffen-SS paratroopers survived the war! 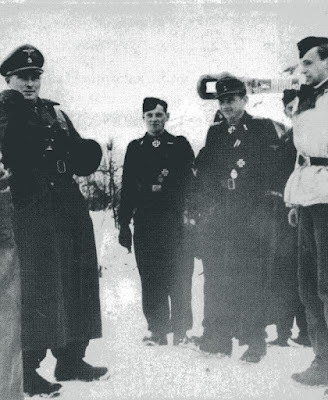 On 14 January 1944, panzer ace Michael Wittmann was awarded the Ritterkreuz des Eisernen Kreuzes (Knight's Cross of the Iron Cross) along with his gunner, Bobby Woll, for their achievements which have so far destroyed 88 enemy tanks. 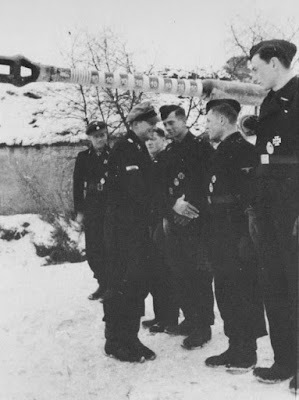 The presentation was made at Vinnitsa, Ukraine, by his divisional commander SS-Oberführer Theodor "Teddy" Wisch, who also nominated him for the Eichenlaub to his Ritterkreuz. This picture shows Wittmann with his crew, from left to right. 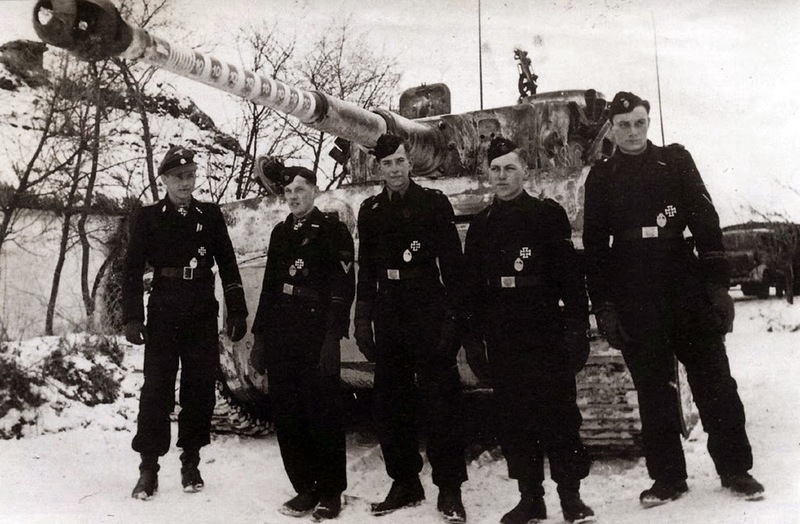 SS-Panzerschütze Werner Irrgang (Funker), SS-Rottenführer Bobby Woll (Richtschütze), SS-Untersturmführer Michael Wittmann (Zugführer in 13.Kompanie (schwere) / IV.Abteilung / SS-Panzer-Regiment 1 / 1.SS-Panzer-Division "Leibstandarte SS Adolf Hitler"), SS- Panzerschütze Sepp Rößner (Ladeschütze), and SS-Sturmmann Eugen Schmidt (Fahrer). 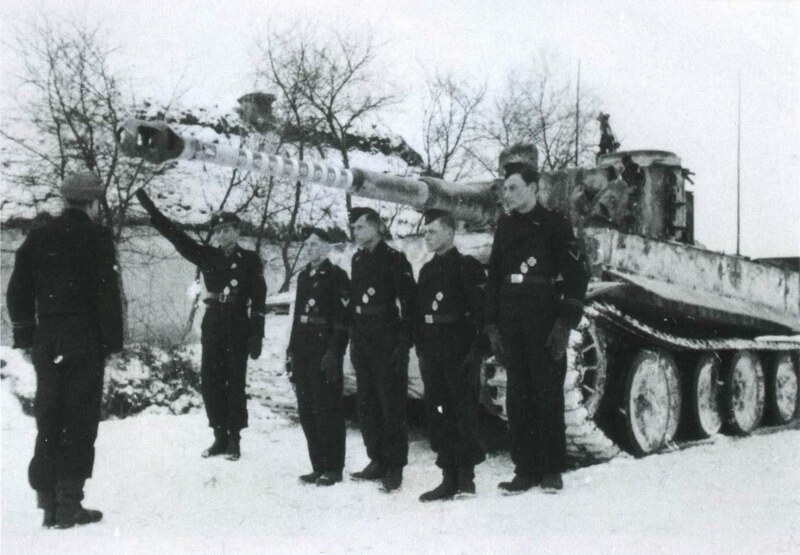 Behind them is Wittmann's Panzerkampfwagen VI Tiger I Ausf.F "S04", with 88 victory rings on its barrel. Actually the Ritterkreuz recommendation sent by Divisionskommandeur Wisch to the Oberkommando der Wehrmacht (OKW) on 10 January 1944 "only" included Wittmann's winnings as 66 tanks, but something incredible happens: in the four day span between the submission of the proposal to the official approval notification, this tank master went berserk and destroyed no fewer than 22 additional tanks to hoist his winning score to a total 88! Practice jumps by the Allied paratroopers were common in the months preceding D-Day; this night jump on Douglas C-47 aircraft was made on 13 May 1944. 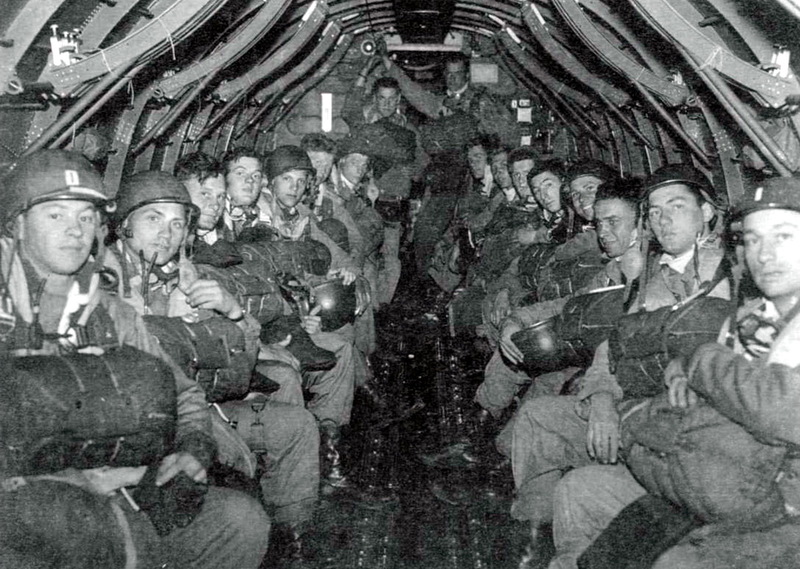 The troopers pictured are members of Headquarters 3.Company / 502nd Parachute Infantry Regiment (3/502 PIR). From left to right, on the left side of aisle: Captain Edward “Poop” Barrett (S-3 of 3/502), Dell Winslow, Sergeant 1st Class Harwell Cooper, two unknown, Joe Lofthouse, and Bill Cady. Standing at the end of the aisle: unknown and George J. Schwaderer. On the right side of aisle, from right to left: Lieutenant Corey Shepard, Fitzgerald, “Eddie” Edwards, Virgil Thornton, two unknown, Kenneth Cordry, and unknown. The Allies are aware that the greatest weakness of the airborne units lies in their lack of firepower. Equipped with small arms, they are not theoretically capable of fighting against an opponent with heavy armored vehicles. Thus, airborne units are to receive the support of gliders troops: the latter are armed with anti-tank guns, Jeep light vehicles and heavy machine guns, equipment for sappers. Signal Corps via Joseph Pangerl. Another view taken in the same plane, same jump, with Dell Winslow (3/502 Battalion clerk) standing in foreground. 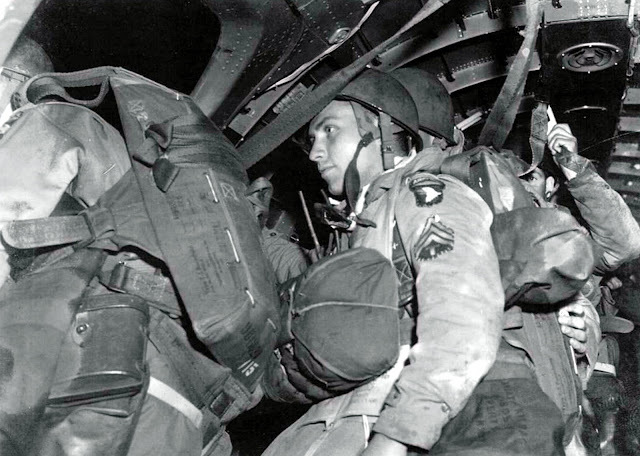 This night exercise resulted in many jump- landing injuries that cost the 101st Airborne more than one hundred troopers who would have dropped into Normandy but had to be put out of the lineup. H/502 jumped over the town of Ramsbury, England, and some troopers landed on rooftops or on the hard cobblestone streets! Melbourne, Victoria (Australia), 14 June 1943. 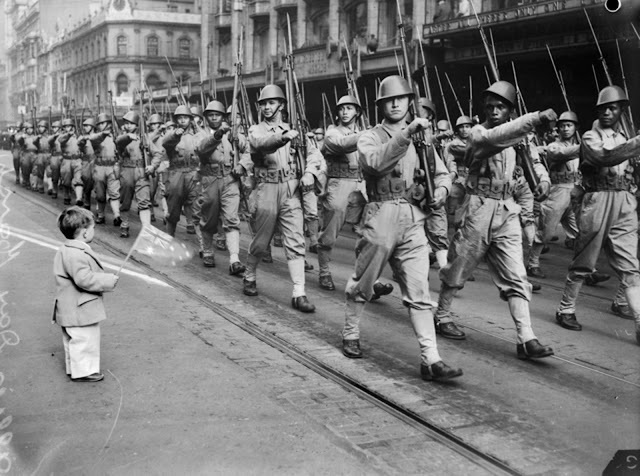 Watched by a small boy waving an Australian flag, troops of the K.N.I.L. (Netherlands East Indies Army) move along Swanston Street during the United Nations Flag Day march through the city. During the Dutch East Indies campaign of 1941–42, most of the KNIL and other Allied forces were quickly defeated. Most European soldiers, which in practice included all able bodied Indo-European males, were interned by the Japanese as POWs. 25% of the POWs did not survive their internment. A handful of soldiers, mostly indigenous personnel, mounted guerilla campaigns against the Japanese. These were usually unknown to, and unassisted by, the Allies until the end of the war. During early 1942, some KNIL personnel escaped to Australia. 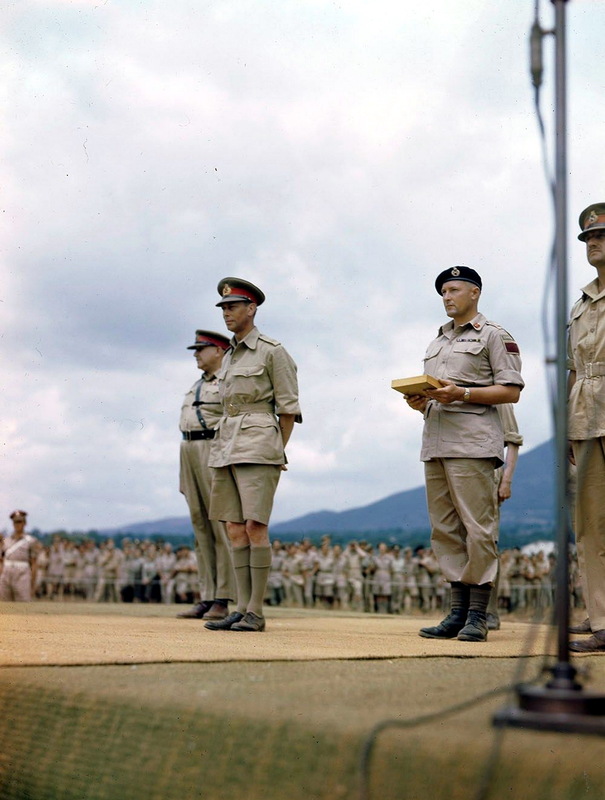 Some indigenous personnel were interned in Australia under suspicion of sympathies with the Japanese. The remainder began a long process of re-grouping. In late 1942, a failed attempt to land in East Timor, to reinforce Australian commandos waging a guerrilla campaign ended with the loss of 60 Dutch personnel. Four "Netherlands East Indies" squadrons (the RAAF-NEI squadrons) were formed from ML-KNIL personnel, under the auspices of the Royal Australian Air Force, with Australian ground staff. KNIL infantry forces (much like their counterparts in the UK), were augmented by recruitment among Dutch expatriates around the world and by colonial troops from as far away as the Dutch West Indies. During 1944–45, some small units saw action in the New Guinea campaign and Borneo campaign. Mix Soldiers (European and locals) of the 10th Battalion / 1st Infantry Regiment / 1st Infantry Division of K.N.I.L. (Koninklijk Nederlandsch-Indisch Leger) after the retreat from Zuid-Sumatra at the Koningsplein Station in Batavia on 1 March 1942. 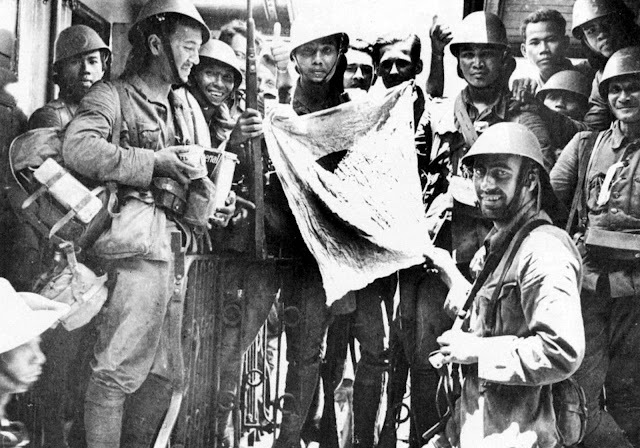 Despite this retreat the soldiers pose triumphantly with a Japanese flag seized between Palembang and Oosthaven. The soldier on the right is wearing the K.N.I.L. helmet with emblem manufactured at Verblifa. The rest of the soldiers are wearing the K.N.I.L. helmet without emblem manufactured at Milsco. At that time, the battalion was commanded by Major de Vries; the regiment was commanded by Colonel Struivenberg; the division was commanded by Major-General W. Schilling, and the overal K.N.I.L. forces was commanded by Lieutenant-General Hein Ter Poorten. This photograph was taken on 28 August 1944 in Northern France by Kriegsberichter Bernhard Kurth of PK (Propaganda-Kompanie) 698, and showed a Heer (Army) officer that served in the Luftwaffe Field Division (possibly 19. Feld-Division [L]). 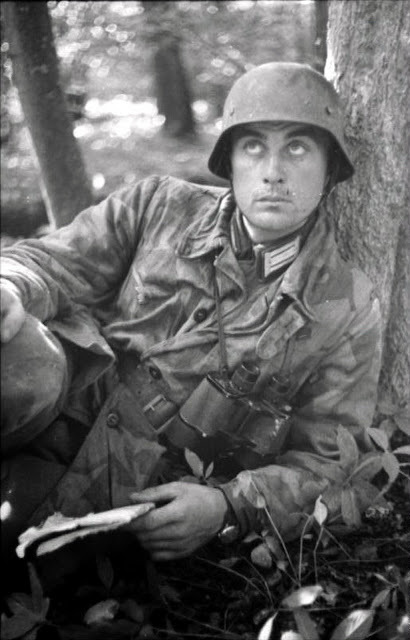 He is wearing a Luftwaffe camouflage smock with the Luftwaffe breast eagle on it, while his uniform is still a Heer one. His helmet is also painted with a rough/textured paint. When the Luftwaffe Field Divisions came under Heer control in November 1943 and were re-designated as Feld-Divisionen (L), Heer uniforms were also adopted at this point, though supply was slow and mixed dress was apparently quite common (if photos are anything to go by). The Jäger Regiments of such divisions wore green waffenfarbe, as they had done in Luftwaffe service. 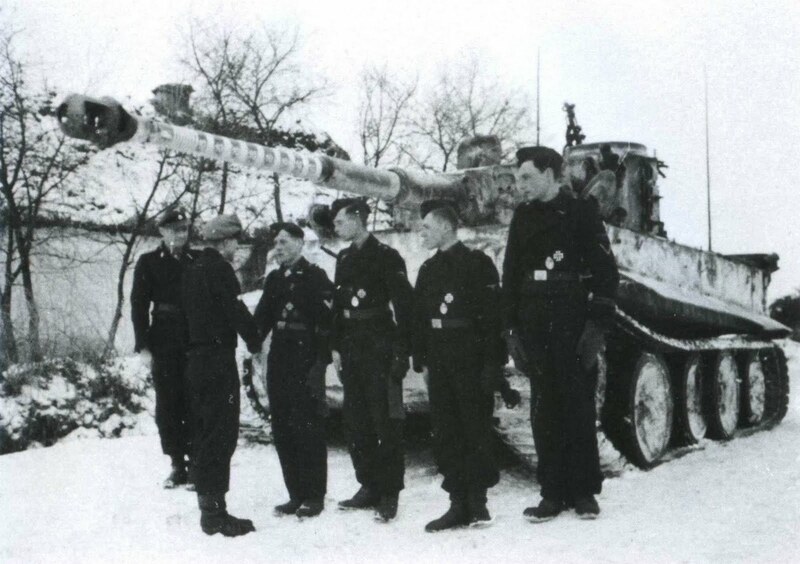 To add even more confusion to the mix, some German units wore Italian Camo instead of their regular issue gear, since they thought it looked nice, and was perhaps more effective than what they were originally given. 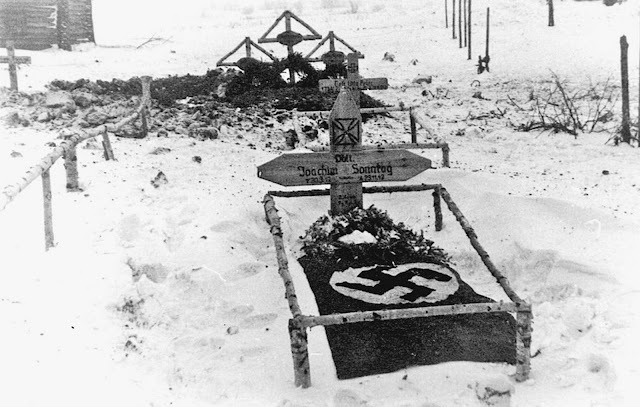 "Half Jew" Oberleutnant Joachim Sonntag’s grave on the Russian front. This picture was taken in the end of November 1942 by Achim von Bredow, a “37.5 percent Jew” according to Nazi law. Sonntag (20 August 1917 - 29 November 1942) was killed in a place about 30 kilometers southeast of Bossino, Belyj, during the Battle of Rzhev against the Red Army. In the fierce battle at Belyj, the Kampfgruppe Krüger - which was part of the 1. Panzer-Division - managed to resist a massive attack by Soviet troops from the 41st Army. 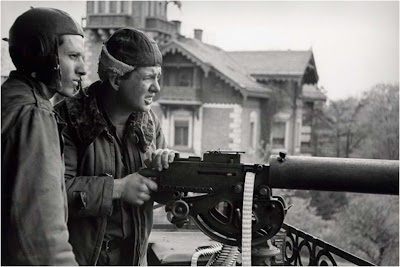 Soviet offensive against the Rzhev salient, held by Heeresgruppe Mitte (Army Group Centre), was launched on 25 November 1942. 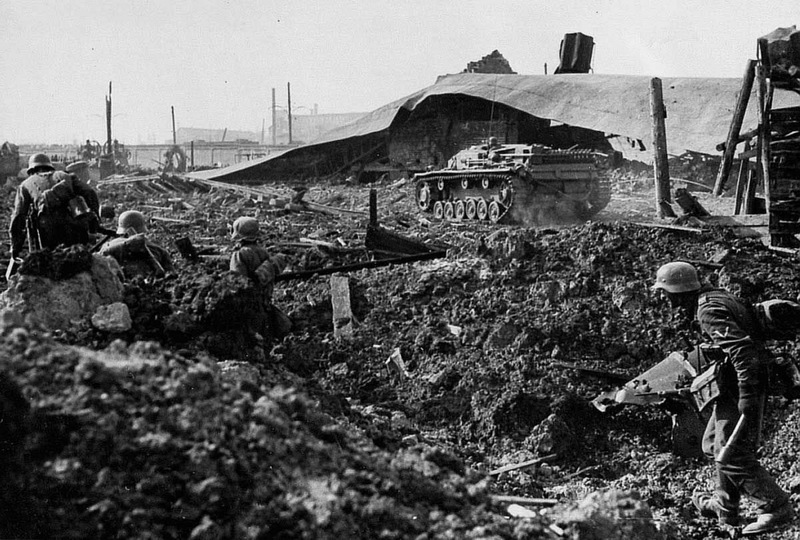 On its western side, Soviet 41st Army units managed to break through the German defences south of Belyj, advancing deep into the German-held front. However, not only did they fail to seize Belyj, defended by 1. Panzer Division’s Kampfgruppe Krüger – which included Panzergrenadier Regiment 113 (Kampfgruppe von Wietersheim, with the bulk of II./SR 113, I./Panzer Regiment 33 from 9. Panzer Division and II./Artillerie Regiment 73), along with two Kampfgruppen from 246. Infanterie Division and 10. Infanterie Division (mot) plus the Füsilier Regiment ‘Grossdeutschland’ – but they also faced stubborn resistance from other elements of 1. Panzer Division. To face the Soviet breakthrough, Kampfgruppe von der Meden was deployed on the eastern bank of the Natscha River. Under the command of Panzergrenadier Regiment 1, it included II./PzRgt 1 (the only tank unit with 1. 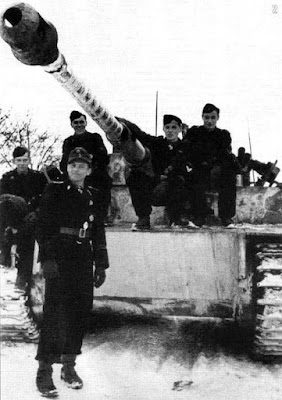 Panzer Division), I and II./PzGrenRgt 1 and the Kradschützen Bataillon 1. 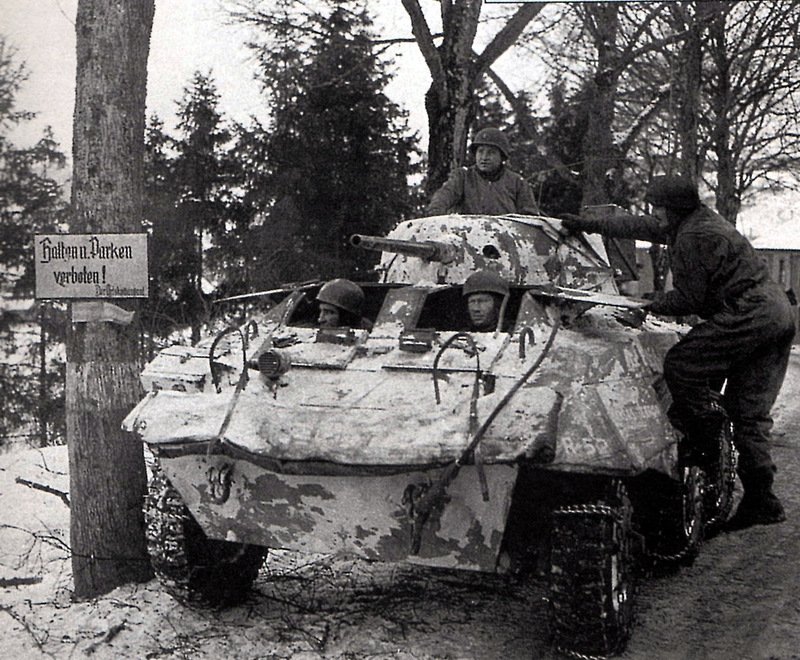 Gruppe Holste, including Panzerjäger Abteilung 37 and Panzer Pionier Bataillon 37, deployed to the south to defend the vital town of Wladimirskoje. These units were to hold their positions until the relief force, made up of 12, 19 and 20. Panzer Divisions, dealt with the enemy breakthrough and restored the defence line. Although the attack by the 41st Soviet Army focused on Belyj, its 1st Mechanized Corps pressed on, and by 27 November had managed to cross the Natscha River in several places to the north and the south of Bossino. Only the stubborness of Kampfgruppe von der Meden’s units, most notably of Kradschützen Bataillon 1, prevented an enemy breakthrough and complete disaster. However, Kampfgruppe von der Meden’s defence line was broken into two; from now on the northern group at Stepankowa could only be supplied via a path opened across the woods. The German situation worsened on 28 November when a new Soviet attack southeast of Belyj broke through the defences and opened the way to the Soviet 47th Mechanized Brigade’s drive north. The stubborn defence put up by the Germans and a slowing in the Soviet attack (particularly with the decision to focus on Belyj) prevented outright disaster, but the German situation gravely worsened. Between 29 and 30 November the gap between Kampfgruppe Kruger at Belyj and Kampfgruppe von der Meden widened, allowing the Soviet 47th Mechanized Brigade to advance north to the Otscha River, before eventually being halted by the Kradschützen Bataillon ‘Grossdeutschland’. To the east, the German front disintegrated, leaving only a series of strongpoints that the Soviets could apparently overrun at will. On 30 November a decisive attack was launched by the Soviet 1st Mechanized Corps. In the morning, following a heavy snowfall, 75th Rifle Brigade and 4th Tank Regiment eventually failed, simply because the German defenders clung to their positions and fought to the last. In four days of combat, II./PzRgt 1 destroyed more than 40 Soviet tanks, and by 30 November it still had two PzKpfw III operational. Although desperate, the German situation was not hopeless. By mid-afternoon the leading elements of 12. Panzer Division joined Kampfgruppe von der Meden’s southern group and counter-attacked the Soviet spearheads at Ssemenzowo, pushing on to Petelino to relieve the encircled Kradschützen Bataillon 1 and eventually linking up with I./PzGrenRgt 1 before nightfall. The Soviet 1st Mechanized Corps switched to the defensive, now aware that the opportunity had been lost and that the German front was going to be restored. 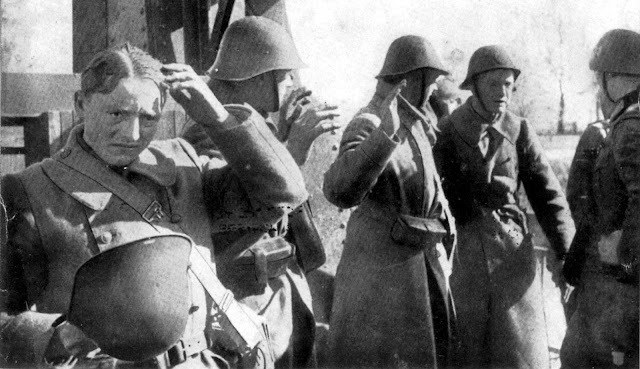 Exhausted Dutch soldiers from 2e Compagnie / eerste Grensbataljon - who fought in the casemate 3056 at the 'Goseling' bridge over the Lutterhoofdwijk Canal - surrender to the Germans after heroic defense on 10 May 1940. 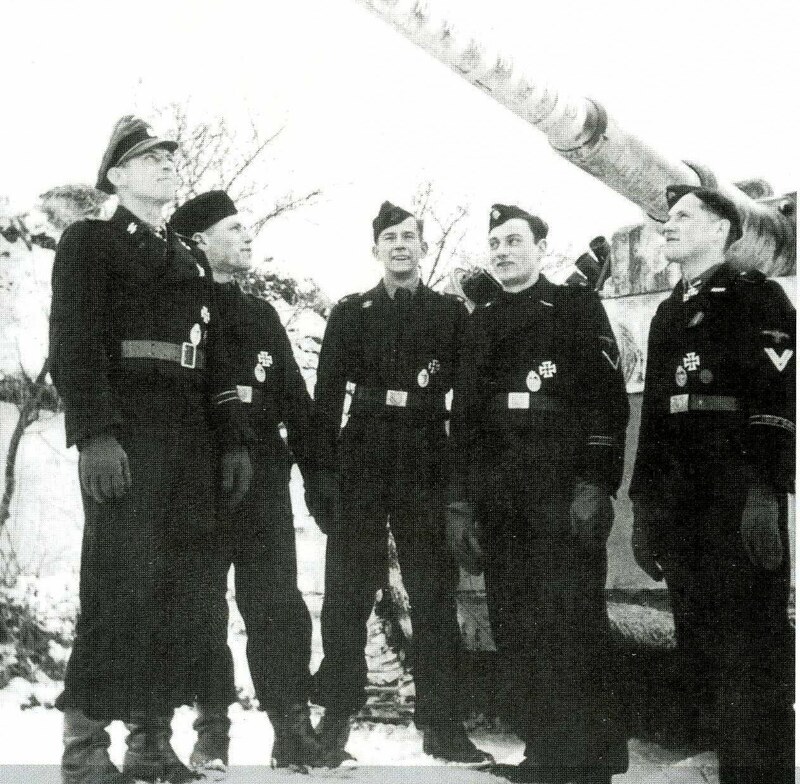 From left to the right: privates Martinus Vugteveen, Sipke Beetstra, Barend Schuiling, and Sergeant Klaas van der Baaren. The sergeant in the background is equipped with the hemet M.27, while the other three soldiers in the front wear the helmet M.34. Sergeant K. van de Baaren and three of his men succeeded in surprising and halting a German reconnaissance group from a well camouflaged casemate at the Lutterhoofdwijk Canal on the southernmost tip of the Q Line. They were able to hold out for nearly four hours against a force of up to three squadrons of the reconnaisance group from 1. Kavallerie-Division. After the four exhausted defenders had finally surrendered, a further drama was only narrowly avoided. The irritated Germans, who had seen a well-loved officer killed, wanted to put them up against the wall as they had apparently misused the white flag during the battle. Luckily, the local innkeeper reported that he had waved a white cushion out of fear. The mayor of Coevorden, who happened to be passing, was able to convince the German officers that the defenders could not have seen the white flag from their casemate. The incident blew over. This picture was taken by S. Pfitzer and later published in the German magazine "Die Woche" for propaganda purposes. 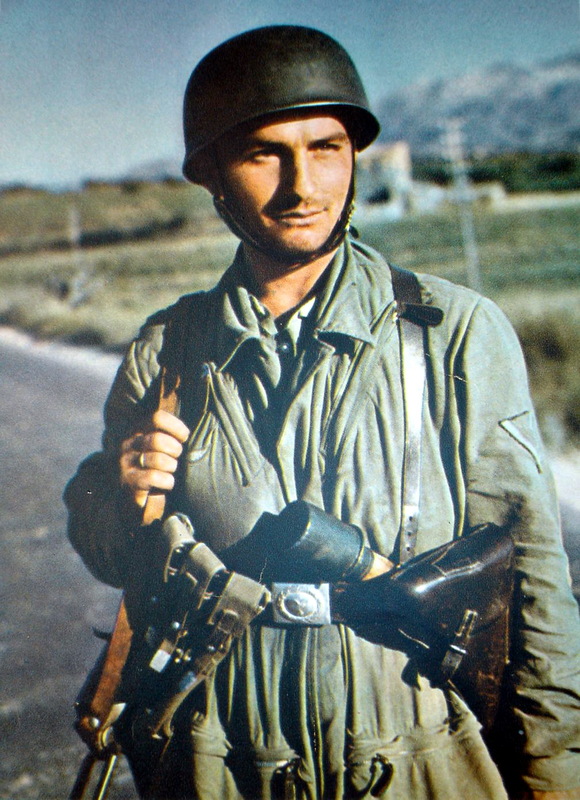 A German Fallschirmjäger (Paratrooper) with the rank of Gefreiter (Corporal) in his light olive green jump smock of the early version, armed to the teeth, during Unternehmen Merkur (Operation Mercury), German invasion of the Crete Island in Greece, May 1941. Unternehmen Merkur began on the morning of 20 May 1941, when Nazi Germany began an airborne invasion of Crete. Greek and other Allied forces, along with Cretan civilians, defended the island. After one day of fighting, the Germans had suffered heavy casualties and the Allied troops were confident that they would defeat the invasion. The next day, through communication failures, Allied tactical hesitation and German offensive operations, Maleme Airfield in western Crete fell, enabling the Germans to land reinforcements and overwhelm the defensive positions on the north of the island. Allied forces withdrew to the south coast. More than half were evacuated by the British Royal Navy and the remainder surrendered or joined the Cretan resistance. The defence of Crete evolved into a costly naval engagement; by the end of the campaign the Royal Navy's eastern Mediterranean strength had been reduced to only two battleships and three cruisers. This picture was first published in a very heavily illustrated book, 'Fliegende Front' (Flying Front), as written by Hauptmann Walter Eberhard Freiherr von Medem, and published by Verlag Die Wehrmacht in Berlin, Germany, in 1942. The book must be regarded as typical propaganda material to show the German population how well the war was progressing. ‘Die Wehmacht’ published a series of other propaganda books during the war. They also released sets of photo postcards from the war. 4 September 1943. 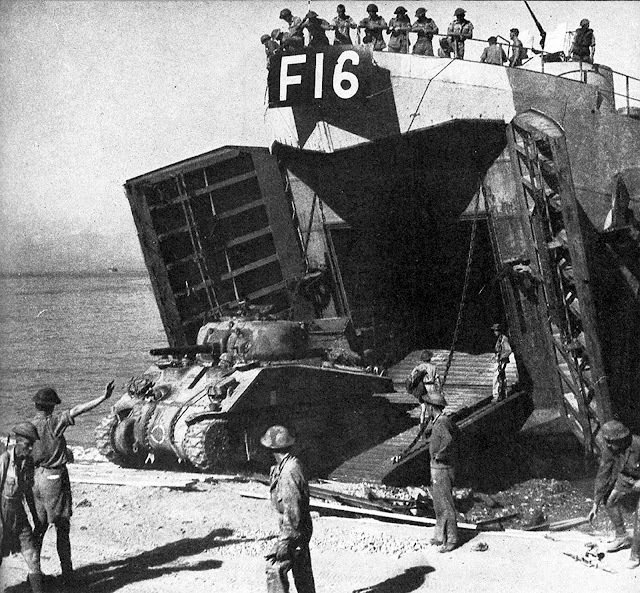 This picture by Alex Stirton shows a tank from C Squadron of The Canadian Calgary Regiment is unloaded from LST F16 at Reggio Calabria on D plus one. The diary from Doc Alexander - a member of the Royal Canadian Army Medical Corps - reported: "Sept. 4: Loaded on LCT at 5 p.m. And sailed up the Messina Straits about twenty-five miles, then turned due East and sailed into the beach just north of Reggio. Landed at 10 p.m., a perfectly peaceful landing. Moved into the Town and bedded down for the night". A day previously, the Calgary Regiment assaulted the beaches of Reggio Calabria to little resistance and moved northwards with notable engagements in Potenza, Motta and Campobasso while supporting the 1st Canadian Infantry Division. During the World War II, due to its strategic military position, Reggio Calabria suffered a devastating air raid and was used as the invasion target by the British Eighth Army in 1943 which led to the city's capture. After the war Reggio recovered considerably. German Fallschirmjäger (paratroopers) rests after the Battle in Crete, 20 May 1941. Certainly a propaganda photo for the homeland, concealing the huge losses of the 'Green Devils'. They are wearing a light olive green jump smock of the early version, with the trousers that were darker than the smock. The Germans used colour-coded parachutes to distinguish the canisters carrying rifles, ammunition, crew-served weapons and other supplies. Heavy equipment like the Leichtgeschütz 40 was dropped with a special triple-parachute harness designed to bear the extra weight. The troopers also carried special strips of cloth which could be unfurled in pre-arranged patterns to signal low-flying fighters to coordinate air support and supply drops. 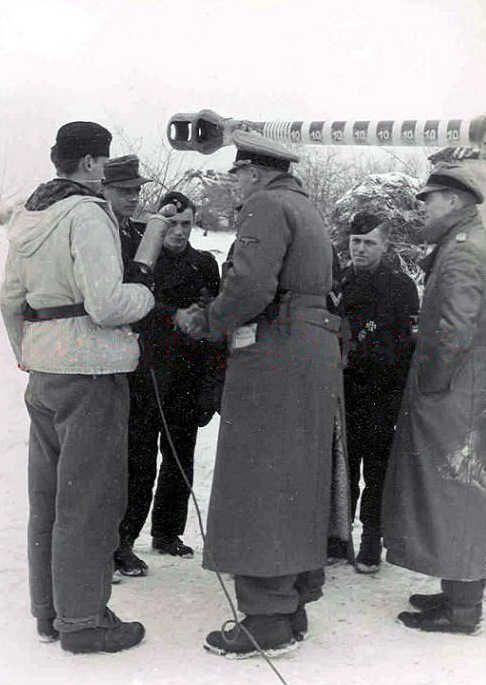 In contrast with most nations' forces, who jumped with personal weapons strapped to their bodies, German procedure was for individual weapons to be dropped in canisters. This was a major flaw that left the paratroopers armed only with their fighting knives, pistols and grenades in the critical few minutes after landing. The poor design of German parachutes compounded the problem: the standard German harness had only a single riser to the canopy, and thus could not be steered. Even the 25% of paratroops armed with submachine guns were at a distinct disadvantage, given the weapon's limited range. Many Fallschirmjäger were shot attempting to reach their weapons canisters. The picture was taken from a very heavily illustrated book, "Fliegende Front" (Flying Front), as written by Hauptmann Walter Eberhard Freiherr von Medem and published by Verlag Die Wehrmacht in Berlin, Germany in 1942. The King of the Great Britain, George VI (center), with the commander of the 1st Canadian Corps, General-Lieutenant Edson Tommy Burns on the right (partly in the frame), and the commander of the 5th Canadian Armoured Division, Major-General Bert Hoffmeister (2nd from right), in Italy on the day of the award ceremony for the Canadian soldiers and officers, who distinguished themselves in combat, 31 July 1944. On 18 July 1944 the 8th Army directed 1st Canadian Corps to begin concentrating in secret near Perugia, in anticipation that they would continue offensive operations by the Army and break through the Gothic Line. The Canadian Corps' role in the attack was to take over the eastern flank of the 10th Corps in the Central Appenines, permitting the 10th and 13th Corps to concentrate for the main assault. In the meantime, the 1st Canadian Division was to reinforce the 13th Corps at Florence. Following a Royal Visit on 31 July 1944, the 1st Division began moving from the Volturno Valley, followed by the remainder of the Corps. Elaborate deception schemes and rigorous security was enforced to hide the move. Unit flashes (as well as the distinctive ribbon of the Canadian Volunteer Service Medal) were stripped from uniforms and identification symbols were removed from vehicles while enemy intelligence was provided false information in hopes of convincing them they Corps was concentrating behind the 2nd Polish Corps. A Dutch officer equipped with the M.27 helmet negotiating the capitulation with a German officer in Willemstad on 14 May 1940. After the devastating bombing of Rotterdam by the Luftwaffe on that fateful day, the Germans threatened to bomb other Dutch cities if the Dutch forces refused to surrender. The General Staff knew it could not stop the bombers and ordered the Dutch army to cease hostilities. At 1900 hrs all hostilities were ceased, except in the province Zeeland. The battle of Holland had ended. Near the German border. January 26, 1945. An M8 Greyhound of U.S. 80th Infantry Division. Three crew members wear the helmet Mk 1 for British motorcyclists (Dispatch rider). The soldier who climbs the vehicle carries a set of USA winter suit. The German sign at left prohibits stopping and parking. In the Battle of the Bulge, The 80th was moved northward to Luxembourg and was hurled against the German salient, fighting at Luxembourg and Bastogne. By Christmas Day, men of the 80th were side-by-side with the tanks of the 4th Armored Division, battering forward through murderous opposition to help the 101st Airborne Division, besieged in Bastogne. Over frozen, snow-covered terrain, the attack gained nine bitter miles despite constant machine gun and mortar fire. The next day, the gap between the rescuers and the besieged was narrowed to 4000 yards. On 28 December, the 80th broke through, bringing relief to the 101st before driving the enemy across the Sure to Dahl and Goesdorf, 7 January 1945, and across the Clerf and Wiltz Rivers by 23 January. On 7 February 1945, the division stormed across the Our and Sauer Rivers at Wallendorf (Eifel), broke through the Siegfried Line, pursued the fleeing enemy to Kaiserslautern, 20 March, and crossed the Rhine, 27–28 March, near Mainz. General Philippe Leclerc de Hauteclocque (Commander of the 2nd French Armored Division) Speaks with crew members of the M4 Sherman - nicknamed "Auerstaedt" - of 1st Company / 501e Régiment de chars de combat (501e RCC), at Ecouché, Northwestern France, 17 August 1944. The crew members are: Bernard Gagneux (commander), Raymond Legrand (gunner), Robert Le Gall (machine gun driver), and René Perrot (driver). All of them wears USA work-overalls HBT (one piece herringbone twill): the first soldier wearing the first model of this suit, while the rest wears the second model. They were also wears US leggings and French berets. When the French army joins the Allies, in the principle they keep their uniforms, then they're started to use British uniforms and ended with US uniforms. They would use all kinds of helmets from all of these armies, mixed with French overcoat headwear and French badges and stripes. Leclerc himself wears a French cap, light-colored US shirt, USA Winter Jacket or Tank Jacket, and - as a distinctive sign - he also wear all kinds of British battledress or combat uniforms, while the pants and leggings is also a British one (in this case, by the look of the pocket button, it is possibly a 1940 Pattern). Malton in Yorkshire, 29 September 1942. Maneuvers of the 42nd Armored Division. On the right is General Sir Bernard Paget (Commander of the Territorial Forces), who takes the top of the two pieces with his greenish color and brown pants of the Battledress. On the left is Sir Anthony Eden (Minister of Foreign Affairs), who takes the complete set of two pieces and has inserted the underside of the jacket inside the pants. British soldiers usually wear the two piece suit of work (Two piece denim overalls), as it serves as an instruction suit work, a combat uniform in summer, or can be worn over the Battledress in winter. The colors vary from a very light brown to a whitish greenish hue. The Denim Tank Suit itself is a whole plethora of color that varies from green to yellowish-green. This suit began to deliver from 1944 onwards, so what the officer wear in this picture is the two pieces, except the one on the right that carries the Battledress jacket. Denim Overalls is defined by Jean Bouchery in the book "The British Soldier" volume one. 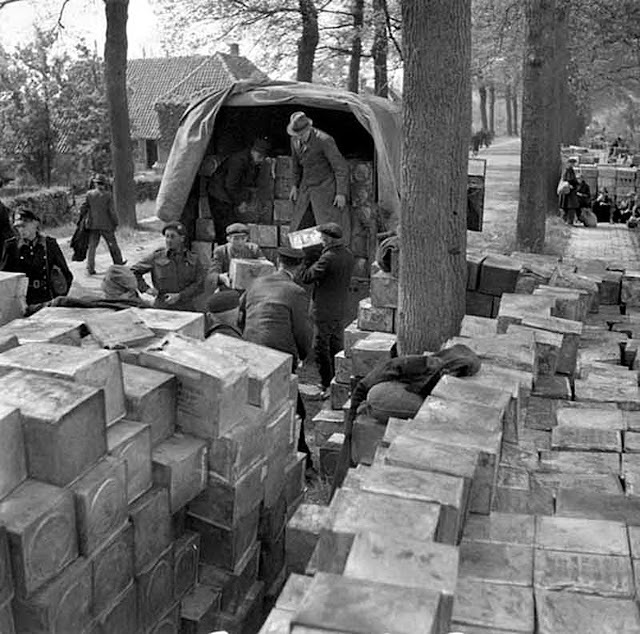 Along the Rhenen-Wageningen road, Netherlands: Dutch civilians unloading food from a Canadian truck to the town dump, following agreement amongst Germans, Dutch and Canadians about the ground distribution of food to the Dutch population. 3 May 1945. Air drops of food by the British and United States had started on April 29th and lasted till May 8th. At the meeting in Achterveld on April 30 both sides decided that the transport by air alone would not suffice. A second operation, codenamed Faust, would also be launched. Two hundred allied trucks from the 21st Army Group would bring food to Rhenen, starting May 2nd. Rhenen was at that moment a city on the German side of the frontline. In Rhenen the trucks would go over in the hands of Dutch truck drivers, who would take the food further into occupied Holland. According to the plan, 1000 tons of food would be transported daily by the Wageningen - Rhenen road. This photograph was taken by Alex Stirton.